Oneplus One is a phone from Oneplus that despite its new succesor still remains the top value for money smartphone in it. It comes in two version the all white version with 16gb storage and the sandstone black version with 64gb storage. 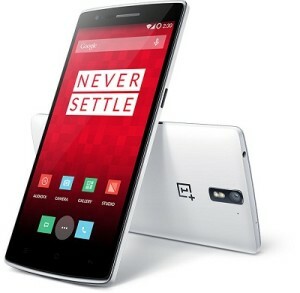 Oneplus One comes at 15.2cm in length,0.8cm in width and 7.5cm in height. And if we take the so small bezels into account this phone looks like a jewel. At the right side of the phone we have the power button and on the left the volume buttons and the sim slot. On the top side we can see the 3.5mm headphone jack and a noise cancellation microphone. On the bottom side you can see the two stereo speakers and the usb plug plus another microphone for the phone calls. Talking about the speakers its worth mentioning that the quality its very good with a very clear and satisfying sound. Around the phone has a plastic band that looks like metal and on the back side it is made from a very unique sandstone black material. As for the screen it is an IPS panel with 401 PPI at a resolution of 1920×1080 FHD and it is 5.5 inches big. The IPS panels offers very good viewing angles and very alive and natural colours. The screen is made from Gorilla Glass that offers scratch resistance and durability. The front 5MP camera can record at a resolution of full hd and its an amazing selfie taker. The main camera has no optical image stabilization but the quality is great. The 13MP can record even 4K UHD VIDEO and the photos are breathtaking even in low light conditions with the use of the double led flash that it houses. Now the see the specs of the devise that made the phone called the flagship killer for its price. It comes with the snapdragon 801 processor clocked at 2.5GHz,for the graphics responsible is the adreno 330 clocked at 600MHz that promises many hours of gaming. The full experience seals with the 3gb of ram clocked at 1866MHz and that means no trace of lag in this phone. As for the operating system Cyanogenmod promises a very customisable experience with no lag. Also it comes with no bloatware installed beside the basics. The phone comes with a 3100mah battery that offers plenty of use and standby time. The device supports all 3G and 4G networks and supports NFC technology. This smartphone can be bought from the official Oneplus One site or on Amazon and other sites.With a price of 330 euros for the 16gb version. And at 370 euros for the 64gb sandstone black version.